We arrive in Manta, a small city with an important seaport with a big harbour and two beautiful adjacent beaches. I am not signed up for a shore excursion today, instead preferring to go for a walk along the wonderful beach adjacent to the pier where we are docked. As we have come to expect on this trip, the skies are overcast and the outside temperature is in the low 20’s, however the humidity is high. After breakfast, I take the shuttle to the entrance to the pier, and walk the block or so to the Malecon Beach. This is a huge beach, several kilometres long. The entrance area has cafes and bars, as well as activity areas for people and families to socialize and have fun. Being Saturday, there are hundreds, perhaps even a thousand or so locals at the beach today. That said, I only have to walk a few hundred metres down the beach and it is virtually empty. There are some lovely beachfront towers built between the road and the beach. It is a great area to enjoy, and so easy to get to from the ship. I meet a friend on the beach, so after we walk for awhile, we decide to have a look at the Cultural Museum located across the street from the beach entrance. There is no charge to enter; however the main desk retains our Holland America passenger cards until we leave. There are some interesting modern works of art, and some cultural artifacts in pottery and gold. It takes about 20 minutes to see the three floors of exhibits, so their collection is not extensive, but it is interesting nonetheless. We return to the ship, taking the free shuttle along the working pier to the gangway. It is always nice to return to the relative comfort of the Rotterdam. In addition to being a deep-sea port for freighters, Manta is also home to the tuna fishing fleet for Ecuador. Many American and Canadian fishing companies operate out of Manta. The nearby town of Montecristi is where Panama hats are produced. There are many tours from the ship returning from Montecristi this afternoon, with passengers sporting new hats as they re-board. I bought a genuine Panama hat many years ago on one of the Caribbean islands. Our departure is delayed this evening by the fuel loading, or bunkering operation that started this afternoon alongside. We go to dinner in the main dining room and are seated at a table with a couple from Liechtenstein. They speak poor English, but prove interesting to talk with nonetheless. After dinner, I take advantage of the ship still being docked after dark by taking some night time photos of the fish boats at anchor, the freighter docking next to us, and the Full Moon reflecting off the water as it drills through the cloudy sky. 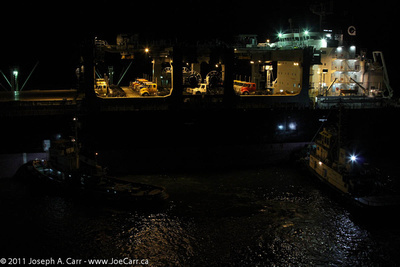 I stay on deck to watch Rotterdam finally leave port around 8:30PM, carefully finding its way out to the Pacific past the anchored fish boats. We sail between Ecuador and Costa Rica today, and in the process cross the Equator for the second time on this cruise. We are still in the cold Peru Current, which has surprised may on this cruise (including myself) with the cool air temperatures (averaging 21°C) despite us being so near the Equator. I catch up on my blogs today, covering both Ecuador and our last day in Peru (Dec 6). Annotating and choosing photos is always a big part of this work. It is formal night, so my friends and I get dressed and go for dinner this evening to Canaletto, an Italian-themed restaurant. A couple of others join us for dinner, which always means there is welcome variety to the dinner conversation as we interact with people from all walks of life. This entry was posted in Ecuador and tagged beach, boats, fishing, harbour, museum. Bookmark the permalink.